Automotive giant Al Habtoor Motors on Monday, June 16, launched the first JAC Motors showroom in Dubai, featuring its line-up of passenger and commercial vehicles. Located at Airport Road, Port Saeed in Deira, Dubai, the showroom was officially opened by Al Habtoor CEO, Ahmed Khalaf Al Habtoor, and Jac Motors General Manager Xiang Xingchu on Monday, June 16. “In the global market, JAC ranks No. 1 position in Brazil among Chinese auto brands and No. 2 of exported brands, and has successfully established a high-end and luxury auto brand image. “Here in the UAE, with the introduction of JAC, we aim to change the face of competition amongst the Chinese auto brands, by offering the market a premium automobile brand,” Ahmed Khalaf Al Habtoor said. JAC J4 is a five-seater luxury sedan with 1.5 liter four cylinder turbo engine that is said to be a perfect combination of fashion and class, featuring safety equipments such as ISO FIX for child seat, ABS-EBD, tyre pressure monitoring system, and dual airbags, among others. J4 generates 113HP with CVT transmission. JAC J5, on the other hand, is a five-seater luxury sedan with 1.8 liter engine which reflects international auto design trends and fashion, which is also loaded with safety features such as dual airbags, motion-sensitive auto door lock, and side impact protection beam, among others. JAC J6, is meanwhile, equipped with energy-saving feature with its sportive design which ensures low wind drag, resulting to less fuel consumption. The seven-seater J6 compact MPV has 1.8 liter engine. JAC M5 is a seven-seater MPV with leather seats, electrical sunroof, visual parking sensor, and adjustable mid row seats that allow versatile seating arrangement, among others. It has 2-liter turbo-charged engine. JAC Sunray is a van and mini bus first released in 2010. The bus version is equipped with reclining seat backs giving it the touch of luxury, while the van version comes with massive 12 cubic meters cargo capacity. JAC light commercial vehicles are available in the range of 3.5 and 4.2 tons and the heavy weight commercial vehicles are available in 8.6 and 12 tons. Both vehicle segments come with turbocharged diesel engines providing heavy duty performance, air conditioning, power steering and radio with CD player and much more. “After our incredible success by being the No. 1 in Brazil we are looking forward to establishing a strong presence in the Middle East. I can foresee a great demand for JAC in the UAE as it is a market where quality products are the most sought after” Xingchu, for his part, said. Xingchu said they ranked No. 1 in export sales for 12 consecutive years, and is one of the top 10 brands in the automobile industry of China. In Qatar, Xingchu noted that they had 1000 units of heavy duty truck sold in just one year. 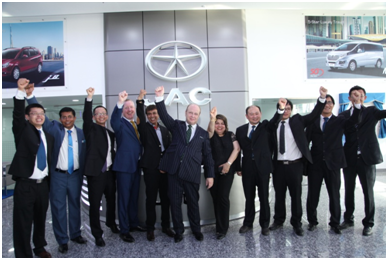 “The products of JAC Motors will give great global appeal and we are proud to bring this global brand into the UAE,” Karl Hamer, managing director of Al Habtoor Motors said.